A Pentagon report says 'adversaries' launched successful cyber attacks against systems on the new 30mm cannon-armed vehicles. It’s been more than a year since the first up-gunned Stryker Dragoon armored vehicles arrived in Europe, giving elements of the U.S. Army’s forward-deployed 2nd Cavalry Regiment a much-needed boost in firepower against potential threats. Since then, unfortunately, unspecified “adversaries” – a term the U.S. military has used in the past to describe the Russians, but that could also mean surrogate opponents during an exercise – have also been able to disrupt certain systems on the vehicles with a cyber attack on at least one occasion. The Pentagon’s Office of the Director of Test and Evaluation, or DOT&E, revealed the existence of the Stryker Dragoon’s cyber vulnerabilities in its most recent annual report on the status of the vehicle’s ongoing development during the 2018 Fiscal Year. The initial batch of these vehicles, also known as the XM1296 or the Infantry Carrier Vehicle-Dragoon (ICV-D), touched down in Germany in December 2017. 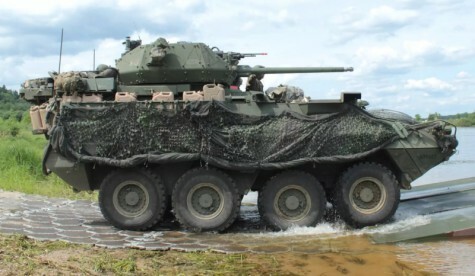 The Army had begun developing the new variant, which features a new turret with a 30mm automatic cannon, directly in response to a request from the 2nd Cavalry Regiment in 2015. Click here for the DOT&E report on the Stryker ICVD, on the DOT&E website. Click here for the full story, on the Drive.com website.